“We have truly lost a one-of-a-kind, larger than life, unique KVMR character and talent. “Wesley Robertson died late this morning from massive injuries he incurred in a car accident last night. Grass Valley Police say they found him at the northbound off-ramp to Idaho-Maryland Road about 11:30 p.m. Saturday night. He was taken to Sierra Nevada Memorial Hospital and later was transferred to a Placer County trauma center, where he passed away late this morning. His wife Mo and daughter Jaimie were there with him. “There simply are no words that can express the profound grief we are all feeling today at this sudden and major loss to KVMR. 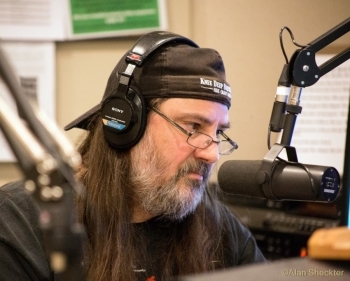 Wes has been an integral part of our station’s volunteer corps for over 30 years, and there could be no better proponent for live music programming, festival broadcasts and his incredible passionate love of ‘Rock’N’Stompin,’ which he has hosted on Saturday afternoons since 1990. “His love of live remote broadcasts was legendary. And, just a week ago, Wes had just completed doing three — count ’em, three — of them in eight days in Placerville and Sutter Creek. You can’t keep this kid in town. “Over the years, he produced our live broadcasts of California Worldfest, the High Sierra Music Festival, KVMR’s Celtic Festival, Hangtown Halloween, the American River Music Festival and On The Road Live at a variety of venues throughout our listening area. My heartfelt condolences to his family and his KVMR family.